Fort Wayne, Ind. 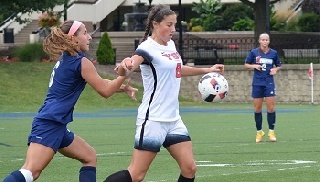 -- The Youngstown State women's soccer team scored a season-high three goals, but could not overcome an early deficit and dropped a 4-3 decision to IPFW on Friday afternoon at Warrior Athletic Field at Indiana Tech University. With the loss, the Penguins fall to 1-2-1 overall while IPFW improves to 2-3. Sophomore Ernestina Abambila had a goal and two assists while juniors Marissa Martin and Katie Hackos each scored their first goals of the season. The Penguins outshot the Mastodons, 17-12, and had 14 shots on goal but could only convert three times. IPFW goalkeeper Kiley Dunning recorded 11 saves. After IPFW took an early 1-0 in the 14th minute, Martin knotted the game, 1-1, with her first career goal five minutes later. Martiin took a pass from Abambila and chipped a shot into the top-left corner from 30 yards out. The Mastodons extended their lead to 4-1 after goals by Kallianne Mogler at 24:42, Allyson Hayner at 40:58 and Mogler again at 56:21. Abambila scored on a penalty kick at the 58:43 mark to cut the deficit in half, 4-2, and Hackos delivered a goal in the 82nd minute to get the Penguins within one. Youngstown State hosts Longwood, Sunday, at Noon in the 2016 home opener at Farmers National Bank Field.